There were hot comparisons between HTC One and Samsung Galaxy S IV which often lead to a flamming war on threads. However one area which S IV won thumbsdown was the OS. HTC One was launched with Android 4.1 whereas S IV came with Android 4.2. However after criticism for not launching the latest available OS, HTC has now come up with a update for HTC One devices. They are being upgraded to Android 4.2.2. And the upgrade comes with some very good features. Perhaps the best feature is the option to have a battery percentage in the status bar instead of just a icon showing the battery levels. You have to activate it through the power settings. Other changes include slight tweak in the overall system, adding a Android EQS and a few more toggles including a power saver mode which now thankfully will not be visible at the top of notifications. One more change is you can now customize the function of long press of home button from Google Not to a menu button. 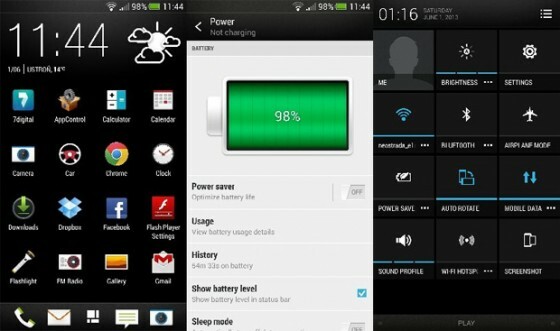 is a bit odd, but Android 4.2.2 will reportedly bring some more customization. What the HTC One users will really hate is retaining of HTC Sense UI 5.0 with the current update. The HTC One users have long been demanding a update to the Sense UI, but HTC seems to have blind eyed the demand. In my opinion, the changes are rather cosmetic without any change in the user experience. But these are my opinions. Upgrade your HTC One to Android 4.2.2 if you have already not done so.